If you are constantly checking your Facebook on your phone or browser, then there’s one thing you need to know: You’re not getting enough sleep, according to a recent research done at the University of California. Professor Gloria Mark, who led the study, asked students to fill out a sleep survey; activity was monitored on their phones and computers—logging when they switched from one window to another, texted or made a phone call. Read the full story at BusinessMirror. Two student teams from UCI took the top two spots in this year’s IEEE (Institute of Electrical and Electronics Engineers) GameSIG Intercollegiate Computer Game Showcase on June 10 at the Cal State Fullerton Titan Student Union Pavilion. Informatics Ph.D. students Mark Baldwin and LouAnne Boyd were recognized with honorable mentions for the 2017 Ford Foundation Fellowship Program. Baldwin was among 410 individuals who received an honorable mention in the Predoctoral Competition, while Boyd was among 220 individuals who received an honorable mention in the Dissertation Competition. Aaron Soto, a graduate student in UCI’s Master of Human-Computer Interaction (MHCID) program within the Department of Informatics, and his team took second place in the 2017 New Venture Competition held May 12 at UCI’s Paul Merage School of Business. 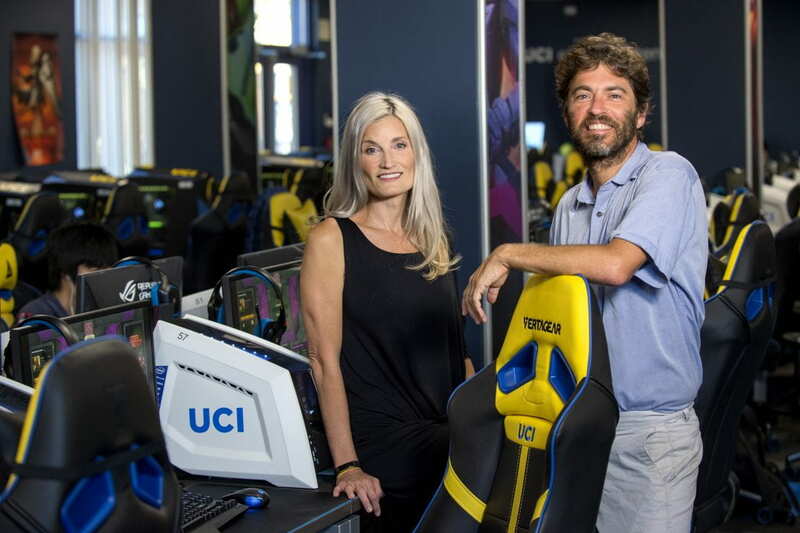 The competition was hosted by the Beall Center for Innovation and Entrepreneurship in collaboration with UCI Applied Innovation. The team’s award-winning project was COMPAS, a product that uses computer access times, along with patient-to-room associations, to produce a live view of patient flow. Soto played a fundamental role in the business competition, having joined the team after meeting its founders at a UCI Cove networking mixer, by literally being their “boots on the ground,” attending various workshops and events to curate the necessary knowledge needed to compete, such as creating the pitch deck used for the competition. ICS alumni Julia Haines, Ph.D. ’15; Sun Young Park, Ph.D. ’14; and Julie Williamson, B.S. ’08 were recently recognized as members of the inaugural class of the Association for Computing Machinery’s Future of Computing Academy (ACM-FCA), a new initiative to support and foster the next generation of computing professionals. The goal of the ACM-FCA is to allow the next generation of researchers, practitioners, educators and entrepreneurs to develop an influential voice in their fields. Gloria Mark is a Professor in the Department of Informatics at the Donald Bren School of Information and Computer Sciences at University of California Irvine. Gloria talks about her experiences as chair of a major conference, not just the work but also the rewards. She talks about how she moved from a Fine Arts background, painting murals on buildings, to a PhD in cognitive science and now studying the relationship between media use, attention and stress, but still being able to be creative in work. She also reflects honestly on her own struggles to manage her screen time and stress but above all she reminds us of the importance of fun and fulfillment in work. 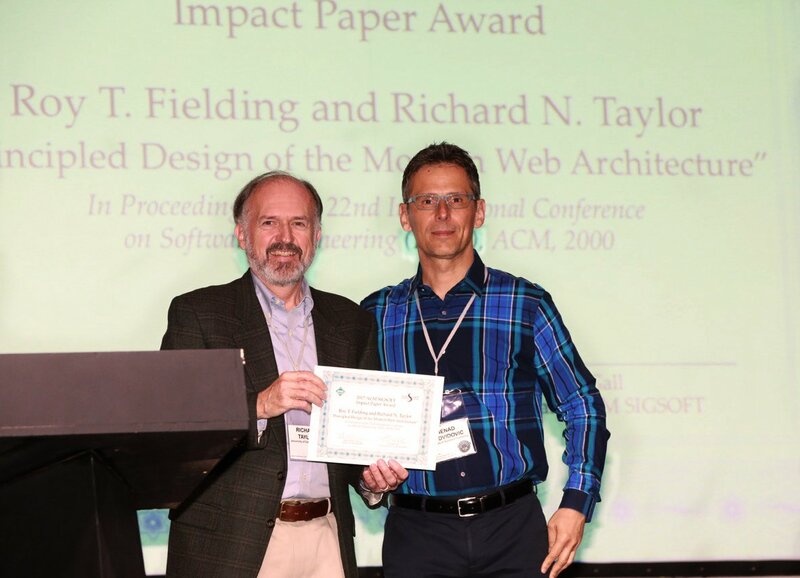 ISR alum Roy T. Fielding and Director Richard N. Taylor received the 2017 SIGSOFT Impact Paper Award at the International Conference on Software Engineering (ICSE) for their paper titled “Principled Design of the Modern Web Architecture,” which was presented at ICSE 2000. The ACM SIGSOFT Impact Paper Award is presented annually to the authors of a highly impactful paper presented at a SIGSOFT-sponsored or co-sponsored conference held at least 10 years prior.